How Norway Funds A Thriving Jazz Scene : A Blog Supreme The country's jazz scene is young, but it's hit the world stage quickly thanks in large part to public funding. For Norwegian musicians, it literally pays to dream big — and to write lots of grant applications. Jan Bang performs a live remix at the Punkt Festival. Did you hear about the Italian gallery owner who burned his gallery's paintings last year — with the cooperation of the painters? It was a sort of desperate smoke signal to his government; a means of protesting funding cuts. If there haven't been similar protests in the U.S. lately, it could be because we're used to declining arts funding. In today's strained environment for arts support, the funding wonderland of Norway can incite jealousy. Yes, Norway is an oil-rich country; it also allots a respectable percentage of its oil wealth to pioneering art, making it a model for exactly what well-spent money for the arts can engender. Especially in jazz. Public support has helped the country's improvised-music scene expand from a handful of artists in the late '60s to a thriving network of recording, performing and educational opportunities today. It's not perfect, of course; I'll address some chinks in Norway's funding armor. But the country's improvised music flourishes largely on public support. It's a cliché to refer to a "Nordic tone" in Norwegian jazz. Many still do, ascribing the geography of fjords and mountains to even the most urban musical productions. But if a single tone underlies Norwegian improvised music, it's probably the sound of jingling kroner. Cultiva's most vital support for music may prove to be its assistance to the Punkt Festival. Punkt's premise is the live remix: A concert of jazz or classical or pop music is followed immediately by a remix of that concert. So while a musical act performs in one room, another artist listens in another room, sampling timbres, rhythms and structures. After the concert ends, doors open to a separate room, where the remix artist improvises a show with the musical material he or she has gathered. "I think it's good that we as musicians improvise with electronics," festival co-director and musician Jan Bang says. "It puts you in a situation that you're not necessarily comfortable with. It's good for creativity. And you could always question people working with jazz, 'How much is actually improvised anyway, or how many licks have you stolen from other people, being it Miles Davis or John Coltrane?' So this is a new way of working with improvised music." In 2005, Punkt's first year, this new way of working with improvisation didn't attract many listeners. Punkt could afford to look past the bottom line, ignoring poor ticket sales and sticking to its original concept while it built an audience. Two-thirds of the income side of its initial budget came from public support. Its major funding was a three-year start-up grant from Cultiva of 400,000 NOK ($69,900) per year, Bang says, along with a typical festival funding mix of city, state and national grants. With towns throughout the country so eager to host festivals, it's fair to count them as a significant source of income for Norway's improvising musicians. Norway has more than 400 music festivals, and 20 jazz festivals alone, offering substantial performing opportunities. This is in a country with a population of just less than 5 million — roughly the population of Alabama. It's no surprise that more than 20 percent of Norwegians attend a music festival each year: They can't help running into at least one. When core musicians of the Punkt Festival were invited to play in Paris last year, they traveled to France with a little help from Norway's Ministry of Foreign Affairs. In 2012, Punkt received 80,000 kroner in support of overseas tours. Norway pays to export its art and culture. The country's pride in its improvised music means international jazz tours have a reasonably high rate of funding: In 2013's first application round for overseas touring support, nearly a third of the jazz requests were granted. Subsidized touring often helps Norwegian musicians play career-boosting gigs at foreign venues that can't or won't cover their accommodation and travel expenses. One serious investment in international promotion is the Norwegian Jazz Launch, which grants a few lucky artists more than a million kroner for three years of touring. In 2004, drummer Paal Nilssen-Love and trumpeter Arve Henriksen were the first Jazz Launch recipients. Their continued steady work on the European jazz circuit today may testify to the award's impact, though, like most Jazz Launch recipients, they already had growing momentum abroad when they won the grant. The Arild Andersen Quintet performs at the 2012 Oslo Jazz Festival. Arild Andersen's work on the jazz scene dates back to the 1960s. He was the original bassist in the Jan Garbarek Group and the go-to bassist in Norway for touring Americans such as Sonny Rollins and Dexter Gordon. Andersen says he has some doubts about the bigger monetary awards for musicians. "When you start giving 1 million kroner for touring support, to put that on just a few artists ... I think that could be spread out more," Andersen says. "Just 10,000 kroner [$1,750] can be the difference between an okay tour and a great tour. It could be more balanced among musicians and projects." Andersen is quick to add that he can't complain. As a Norwegian who records for the well-known ECM Records, he's gotten his fair share of record-label and public support. For three years running, Andersen received the Norwegian Arts Council's Ensemble Support, which he's used to partly fund tours. For example, some of this money covered his band's flight and hotel between two dates in Sardinia and Copenhagen last summer. In Norway, there's often another funding channel. Norway's jazz tradition is young. That means new projects don't compete with history for resources. There is no Jazz Messengers tribute to fill trumpeter Arve Henriksen's festival spot. The opportunities — the festival gigs, ensemble funding and touring support — are open to emerging musical acts and fresh projects. The jazz tradition Norway does claim is founded on native innovation of the form. Saxophonist Jan Garbarek, the first Norwegian jazz musician to make his mark abroad, did so with a unique style that has been described as Nordic. American composer George Russell called Garbarek "just about the most uniquely talented jazz musician Europe has produced since Django Reinhardt." Garbarek's legacy, along with the sheer youthfulness of Norway's jazz scene, has created an obsession with innovation. Today, many in the Norwegian jazz industry believe every note should be shiny-new; that the best concepts are the most outlandish ones and improvised music should advance faster than the speed of sound. Outgoing Music Information Center director Kristin Danielsen is asked if there's a place for more conventional music in Norway's funding system. "A lot of people say that you can forget about getting funding if you're not doing something crazy," Danielsen says. "You know, if you do something experimental and you live up north, you're sort of home free for life, because you're so 'correct.' Whereas standard repertoire played in the traditional way — the sort of thing you can see all over America all the time — if we try to do that in Norway, it's like, 'Why should we do that? There's enough of that.'" Danielsen was describing a perspective she doesn't necessarily endorse herself. But celebration of Norwegian originality does often come at the expense of American jazz, which is caricatured as a world in which all musicians play the same sepia-toned licks in an echo chamber of nostalgia. This is certainly the view of British journalist Stuart Nicholson, whose 2005 book Is Jazz Dead? (Or Has It Just Moved to a New Address?) pitted European innovation against American conservatism, using Norway's music scene as a chief example. Innovation obsession is nurtured at the influential Trondheim Music Conservatory Jazz Program. Its graduates include many of Norway's most successful (and well-funded) musicians. As Jazz Program director Erling Aksdal explains, his teaching philosophy reflects the "highly egalitarian culture in Norway where authority of any kind is always questioned and people's general sense of self-value is high." This gives a jazz student, Aksdal says, an "inventor's belief in her/his uniqueness." Norway's egalitarianism creates humility — "I'm no better than him" — but the inverse also has traction: "He's no better than me." Egalitarianism can give a young Norwegian jazz musician the conviction that his music is as original as Monk's or Garbarek's once was. Even if the musician is wrong, false confidence may inspire him to create something interesting. "What at the outset may look like a chauvinistic attitude usually is a springboard to a fantastic world of discoveries," Aksdal says. The Jazz Program's focus on innovation benefited guitarist Stian Westerhus. "I basically made my own curriculum for what I wanted to do," says Westerhus, who's won some of Norwegian jazz's most coveted awards since earning his master's degree at Trondheim in 2005. "I think the freedom of not being taught aesthetics, in combination with being in a tiny environment with some of Norway's most talented young musicians, was for me a near-perfect bubble to enter for two years. It taught me to trust my own music — and the value of hard work." Considering innovation's possible boon to young creativity, and its currency in the funding world, many Norwegians who don't buy innovation obsession are content to live it. It's a valuable business. 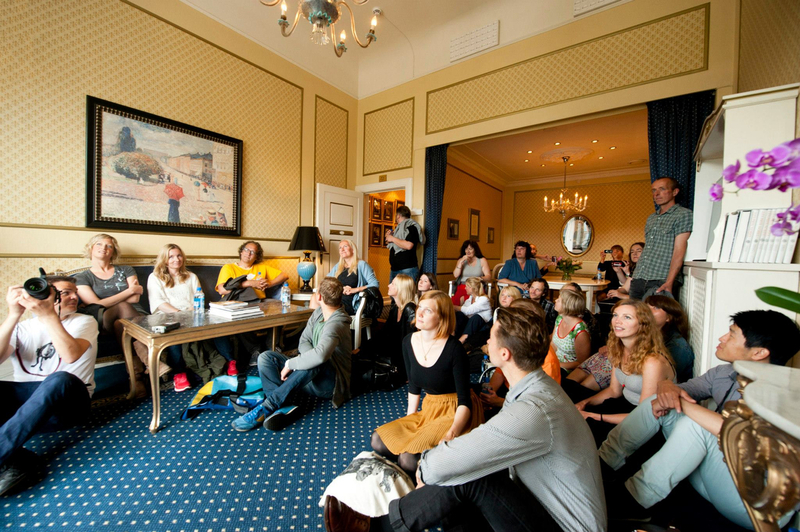 Listeners gather in the Oslo Grand Hotel's Nobel Suite for a Havresekken performance. 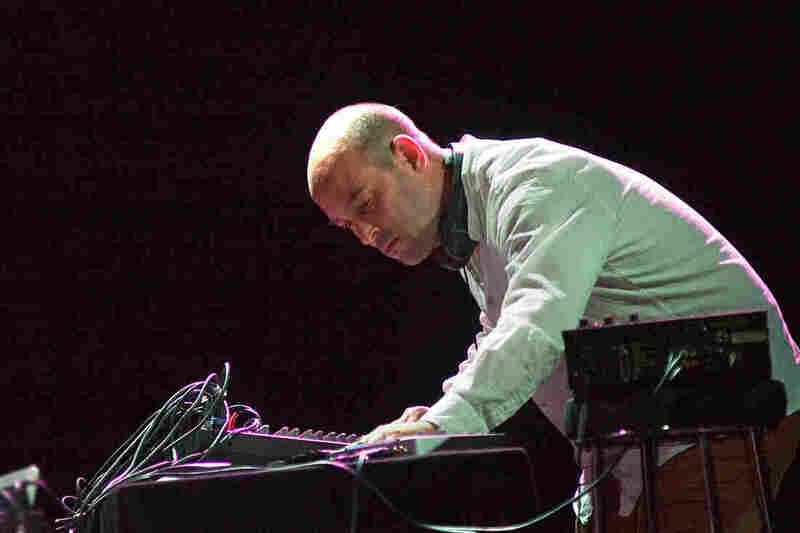 Havresekken's disorienting settings and unexpected performances are designed to trick mainstream-minded listeners into appreciating more experimental music, like jazz. Orchestrating the sound of surprise into the concert-going experience has great appeal for funding agencies. Along with city and state grants, Havresekken receives funding from the Norwegian Arts Council — and its Arts Council Organizing Support award has more than doubled since 2011, when the series began. "We've talked to other festivals, and they're like, 'Why do you get funding?'" Havresekken director Sigrun Tara Overland says. "They maybe run a straight rock festival in a big town on a set stage where they make a lot of money off selling beer. Whereas we do lots of crazy stuff with combining new music together and introducing music to new people. And it seems like the Norwegian Arts Council appreciates that." Overland says she and her colleagues did not generate the idea for Havresekken with funding in mind. At the same time, as they developed the idea, they were not discouraged by financial concerns. This wide-open field of possibility for improvising musicians and music presenters may be the most valuable legacy of Norway's public arts support. Ambitious ideas aren't crushed under the weight of impracticality before they can grow and take shape. That could change. Some leaders from the country's political right have called for an end to public arts support. And Cultiva, the private foundation established by the town of Kristiansand, had to put a hold on grants starting in 2012 because the drop in international markets reduced the value of the foundation's interest income.